One of three similar plaques located immediately to the north and south of Greenwich Park. This one (and one other) faces south and has east marked on the right and west on the left. The one facing north has the east and west markings reversed. 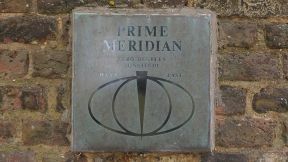 In 1984, at the time of the Meridian’s ‘centenary’, one of the marks to the south was found to have been mounted in error about six metres to the east of the Airy Meridian. Given the circumstances, it seems likely that this mark too was originally mispositioned.